SSR LLC – Air Products – Back Down the Rabbit Hole? Air Products – Back Down the Rabbit Hole? The Air Products of the fiscal Q2 2017 conference call sounded a bit too much like the Air Products of 2012 and early 2013 in our view. APD has lots of cash and is going to spend it – and a last resort/back stop will be to give it back to shareholders. The CEO talked about having a total of $8bn of potential investment dollars over 3 years. This may have been a bit of a smoke screen and there may be larger acquisitions on the horizon – but it is unclear what they would be. While this comparison with past APD is a little unfair – the tone of the strategy is a little troubling and does sound familiar. The old APD was chasing large scale investments – often associated with China coal gasification and at returns above the cost of capital but dilutive to overall returns. In addition – these larger investments are more significant problems and have a deeper impact on earnings when they are late or when they do not work at all – Tees Valley! One of the beauties of the traditional industrial gas model is that earnings are not overly, or even noticeably impacted by the fortunes of one asset. As project sizes get bigger the model changes and APD has the risk of morphing into a more traditional diversified chemicals-like company or worst case something which looks more like a regulated utility. 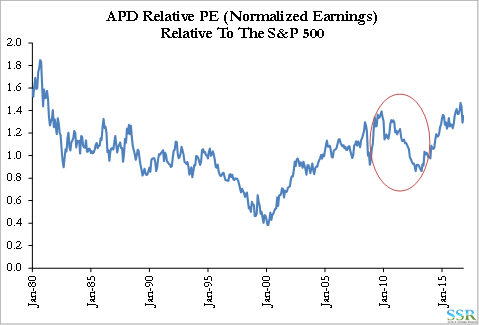 Neither of these models warrants the earnings multiple that APD has today. APD may have some tailwind near-term if the new project bidding landscape is changed by the acquisition and merger distractions at Air Liquide, Praxair and Linde, allowing APD to raise project margins. 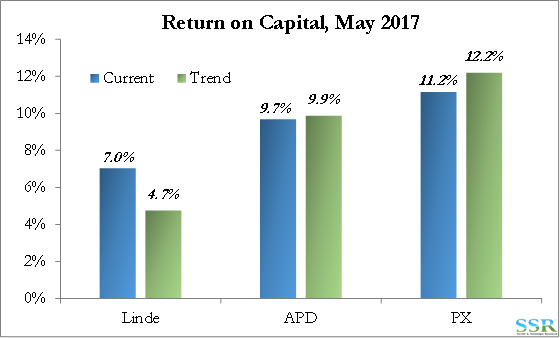 APD’s return on capital has improved since 2014 because the company has aggressively cut costs not because the asset base has improved. The current strategy sounds too much like the one prior to the management change. We are concerned about underlying growth in the Industrial Gas space and see APD and PX as expensive against that backdrop – PX has the possible merger synergies – APD does not have an obvious bull case. We would be short APD and long the PX/LIN deal through LIN. Air Products quarterly discussion last month was a little reminiscent of the Air Products of the earlier part of this decade; a story that got the company in trouble and got the current CEO his job. The idea that increasing piles of cash can be invested in projects that are additive to both margin and returns on capital is an idea that the company followed from 2010 through 2013, adding to the capital base, but at the expense of returns. PX dialed back its capital spending as potential opportunities showed lower than acceptable returns – APD kept going – moving further and further off-piste – Exhibit 2. Air Liquide is a little distracted with an acquisition. PX/Linde are potentially very distracted with a merger. These may move the competitive bidding process a little in favor of APD. Perhaps there is a turn in economic growth? Air Products has a lower cost base than before, but we would be surprised if its cost of project delivery has changed that dramatically and it was a laggard 5 years ago. The bigger the “fixed margin” project and the larger the share of the portfolio it becomes the bigger the impact of execution risk. Very important that APD sticks to its knitting and does not get lured off-piste again – we think that there is minimal risk here but if your goal is to spend you can be tempted. The highest margins in this business are associated with optimizing sales and operating rates around a well-placed air separation plant, with high incremental margins. The very big, isolated, limited growth (once built) projects (syngas, gasification, hydrogen) pull you towards a model that looks more like a regulated utility than a traditional air separation business. Regulated utilities do not trade at the multiples that industrial gas companies have traditionally enjoyed. The mega projects tend to be in countries and regions that carry above average geopolitical risk. Just as important, although we would hope probably less of an issue today, the big stuff can distract you from the small stuff. 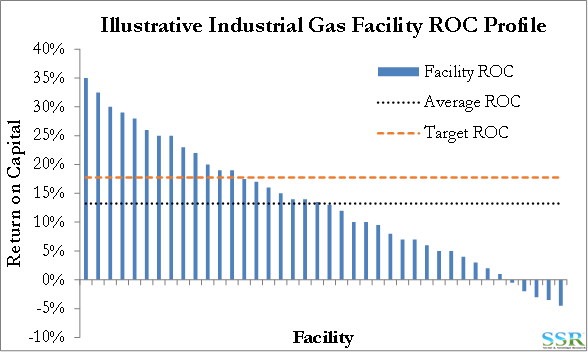 Each of the Industrial Gas companies will (should) have a chart – or series of charts – which resemble the generic illustration in Exhibit 3. Each bar represents a fixed asset, whether it is an air separation unit, a cluster of units run as one business, a hydrogen plant, a packaged gas business etc. Each company will have some stars – almost fully depreciated assets, well loaded; and each will have some disasters – where the base customer has shut down or something else has happened to result in low rates or higher costs. Every company has an average ROC that is below their target. Very crudely and a little unfairly (but only a little) Praxair’s strategy from 2000 to today has been to only build new stuff that is well above the line, while at the same time trying to fix all the stuff below the line – or sell it. Before 2013, APD seemed only focused on trying to build big things that would sit on the left-hand side of the chart and pull up the average. Some of those investments disappointed and returns fell. APD’s focus on the $50-100m investments took focus away from the equally important $1-5m decisions that dealt with the tail in the chart above – at least this was our view. This set up the valuation dip that allowed for the activist to step in and the changes that followed. 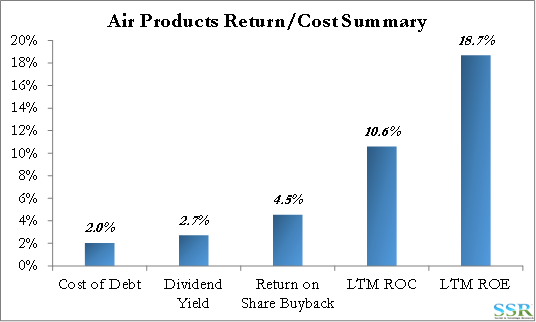 Air Product has made some major portfolio changes in the last 12 months with the sale of the materials business and the spin of Versum and these have had a dilutive impact on both margins and returns on capital. However, while these were likely the right moves for the company, they do increase the focus on the risk of large scale off-shore capital deployment because of the smaller base. It is obviously not possible for both Air Products and Praxair to merge with Linde – only one of them has that opportunity and PX has won. APD is not prevented from chasing after Linde, but it would need to be a purchase at a high premium to better what PX is offering – so unlikely. PX is very good at “fixing small” – focusing on the incremental projects and minor strategic moves to optimize a portfolio. This is the opportunity in the merger with Linde – Exhibit 4 – and why we believe that it could result in a very good longer-term story. APD is now caught between a strategic “rock and a hard place” in our view – the company has two options – optimize the current portfolio incrementally and return cash to shareholders, or swing for the fences with the only larger projects available, which tend to be outside the US and very capital intensive. Because the projects are large the risk becomes more significant – as APD has already found with Tees Valley. 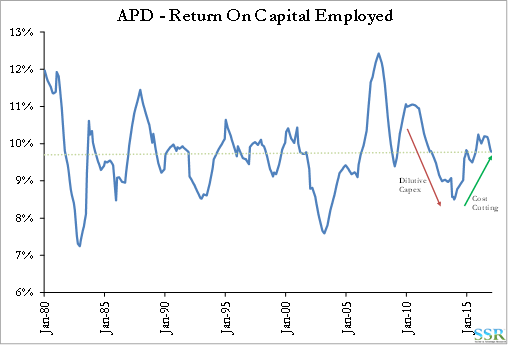 But there is a second risk in APD’s thinking, which we have alluded to already and is best explained using the data in Exhibit 5. APD has a very low cost of debt relative to its return on capital. Buying back stock has a low return relative to investments at current returns on capital or well below. One could be persuaded that any investment with a return above 6-7% is better than buying back stock and mathematically you would be correct. The return on buying back stock is low because the multiple of earnings is high – it is high because returns and margins are high and if they fall the multiple will likely fall – Exhibit 6. Buying back stock should always be the first choice for Industrial Gas companies versus any capital investment that dilutes returns. 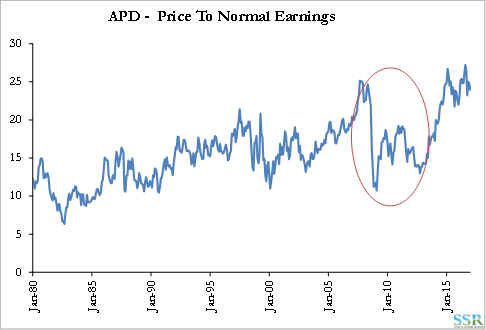 We think that APD should be buying back more stock and taking less risk with its capital spending ideas – or its likely to be back down the rabbit hole again!